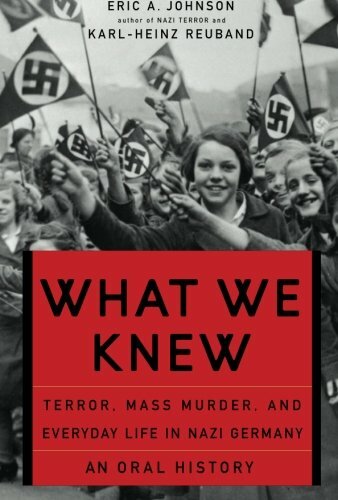 2006 Basic Books trade paperback of the 2005 oral history of Nazi Germany. I found this copy last week in the Maybelle Little Free Library. Edit March 21, 2019: This was a very thorough examination of actual people involved. But of course, their stories are all over the place. The authors attempt to summarize in some tables, which helps. It seems to come down to the fact that people will only see and believe what they want to. And their perceptions shift along with the general culture. So there is no magic observations of any general awakening, and there would not have been so from any other outcome of the war. But a few people on the margins do seem to recognize horrors for what they are, and to resist them. We can easily see much the same process playing out now with the wide acceptance of mass Islamic atrocities, that media and the general public remain almost completely indifferent to, because they either support Islam or appease Islam in foolish attempts to adhere to political correctness of our foolish time. I currently have this ranked at #1927 on my ranked list of best-read books lately. And please visit the next meetup of TriValley BookCrossing group, at Panera Bread in Dublin, the second Tuesday of each month. And if you are now hoping to catch or release another book, but don't know where, check out my home page for a full list of all the local Little Free Libraries and other great release zones, where books can be safely left and found!